BRAVO, Diesel powered generator set. The generator set is composed of diesel engines, and separately excited, self-regulated alternator. The engine and alternator are mounted on common, heavy-duty fabricated steel base frame. 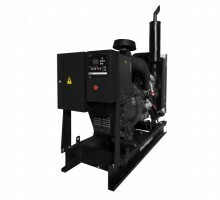 The Genset is equipped with control panel mounted via a set of anti-vibration mountings. The Genset comprises a residential silencer, electric starter, a set of batteries. The base frame is of special design to ensure rigidity and to provide overall support to the unit. The base frame is a pre-fabricated, welded construction. All equipment for each generating set will be mounted upon the common base frame, complete with local control panel, electronic governor. The engine and Single bearing alternator are close coupled, with flange connection between alternator frame and flywheel housing. A rigid coupling is used between the engine flywheel and alternator shaft. As an option we allow for the generator set to be painted our BRAVO colour. The generator set is tested with the Control Panels and associated equipment and that by using the load bank at our factory with test report for each Genset. Warranty and responsibility against defective workmanship & parts for a period of One Year or 2,000 Hours from Date Of Delivery which comes first.